The White House reportedly attempted to block former acting Attorney General Sally Yates, who was fired early on in the Trump administration, from testifying about ties between Trump campaign officials and Russia, the Washington Post reports. Recently obtained letters reveal that the Department of Justice told Yates earlier this month that the administration was invoking its "presidential communication privilege" to prevent her from testifying before the House Intelligence Committee. 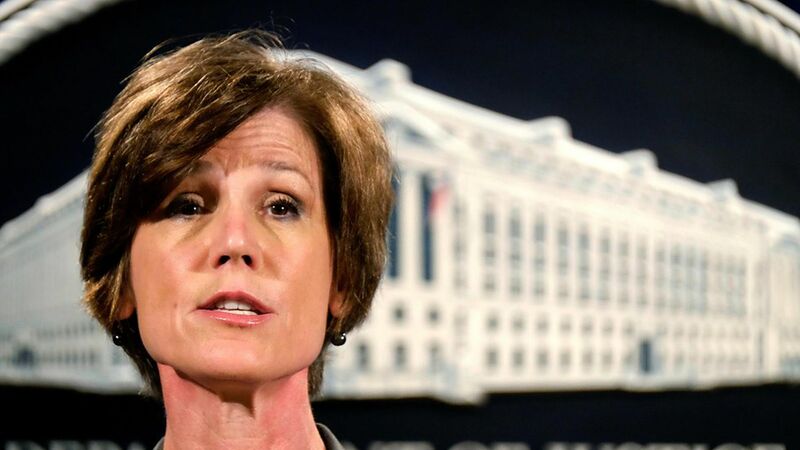 The move came after Yates' attorney sent a letter stating that she was willing to testify, and would avoid discussing classified information that could compromise investigations. The letter was shared with the Intel Committee. The next day committee chairman Devin Nunes canceled the hearing altogether. Earlier this year, reports surfaced that Yates had warned the White House that former National Security Advisor Michael Flynn could be subject to Russian blackmail due to his false accounts of his contact with the Russian ambassador. Sean Spicer has called the report "entirely false": "The White House has taken no action to prevent Sally Yates from testifying and the Department of Justice specifically told her that it would not stop her and to suggest otherwise is completely irresponsible."